If you are in debt, you are drowning and need emergency action. Practically everyone in debt sees all their friends in debt and imagines that it is an unfortunate but acceptable situation. Drowning is not acceptable, and it is far worse then merely ‘unfortunate’. So, what can you do right now to save yourself? The very first step you can take is an easy and fun one. Basically, all you need to do it get one new credit card to replace all your current credit cards. Seems weird, doesn’t it. But soon you will understand. Cut up and destroy your credit cards – all of them. Your general cards, gas cards, department store cards, yes, all of them. You cannot solve the problem until you at least first stop the cause. It’s like attempting to quit smoking while you are still smoking or tying to lose weight while you are still overeating. First, you must stop causing the problem. Second you can begin to cure it. Once the card is gone, then order a new one. This may seem like strange advise, but pay close attention. This time order a prepaid card. You see, these days, a card is actually mandatory for survival. You cannot rent a car or even get into a hotel bedroom without one. You have a problem that you need one but it is the cause of the problem. So, what do you do? You get a prepaid card. It looks and acts exactly like a credit card. And, you cannot be refused one when you apply. Every single application is accepted. The only difference is that you must first pre-load the card with your own cash. Then, you spend your own cash using your card. You are never declined because it is your own money. There is no risk whatsoever to the card-issuer. Also, it has the educational advantage that it teaches prudence and record-keeping. With a prepaid card, you cannot overdraw. You cannot go deeper into debt. You cannot worsen your situation. That’s the first step. It doesn’t get you out of debt, but it does stop you getting deeper. Stopping the fall is a crucial first step. The second step begins the process of climbing out of debt. Do you have feedback about this article? Please post your comments, questions, and success stories below. I promise to read every single one. I have no credit card debt but I still love this idea. It could be used simply for budgeting purpose to make sure we play within our limits. That’s a great first step. But what do people then do to reduce the debt they currently have on all the cards they just cut up? What you recommend is a good first step, but it’s 1 step only. That’s odd, I use my debit card first then my credit cards, but only if I have to. That’s good except for one thing, suppose you have no money to put on a prepaid card, but you have a low principal card of $500 to get you through until you get cash. I’am talking just enough for gasoline and food. Only have a card for necessities when I run totally out of money. What about that kind of situation. If you cut up all your cards you could be in a pickle. I can’t afford to do that. I am working myself to that point. In a few months will have car paid for than I can consider doing that. I don’t think for everyone that will work. I am alone, no other money to lean on. Where do you get a prepaid card? I believe that you can go to Money Mart/Western Union and apply for one. When you need to use a credit card (as a last resort) such as on a vacation or vehicle rental, use a pre-paid credit card. We need to abolish the credit card consumer mentality. Otherwise, we will allow the crooked banks to become wealthy at our expense. Not nice. Hi Raymond. It is a good idea if I had anything left to put on the card I already have. I have been getting “hammered” with insufficient/unavailable funds fees in the last 6 months. I have not worked a linear job since Feb but soaking up information like a sponge trying to learn alternative home-based/online income ways. I was already in the rears of debt before, I made it worse. When I can load a prepaid card means I am doing better. Thanks for your telesiminar interviews. My doubt is a prepaid card is the same as a debit card? I have a debit card but It is the first time I hear about a prepaid card. Could you please give more information about this type of card? Is it new in banks? like VISA gift cards do? Good advice. I maintain one credit card for travel use and large ticket item. I dont’ carry it with me as every purchase is well thought of, and well planned. I withdraw enough cash to pay for my monthly expenses. Any leftover goes to my investment account. It takes a strong will to stick to the program you choose. All my cards are maxed out and on payment plans. I use a debit card for everything I would previously have used a credit card for. Now – what’s step 2?? BTW – I heard your interview on the Intention Event. Powerful stuff – as always. I’ll be pulling out your goal setting program and setting up my MTO. Thanks for the reminder! Good advice IF a person still has an income, and has had trouble keeping track of spending. I know where every nickel goes, but alas, that last nickel is gone…like my job. With a nonexistant job market, my option now seems to be to start my own biz. A real rollercoaster of enthusiasm and trepidation. Not where I expected to be at this point in my life. That is a very good idea asking for a prepaid credit card.I didn’t know there’s one I’ll try to ask my bank to give me one. It does make sense – especially for those that still have a job! There is one thing that should be remembered and that is, at least once every six months the credit card(s) need to be used or they can be cancelled by the issuing bank. Once that happens, the debt to available balance ratio goes up and then the interest rates go up. Hopefully, people realize that they need to limit their debt if they want to keep a decent credit score. Since losing my job, my credit score has gone into the trash can and now everything costs more – insurance, interest, etc. And, worse, it might be keeping me from getting hired. I’d recommend people try this method just to see if it works. Although, they need to make sure they keep enough money to pay the real credit cards! it’s a good alternative to cut all the cards and then go and get a pre paid card. I would rather abstain from using any credit card and use cash or debit card instead. Talking from my own experience. Do the basics to get rid off the debts. 1. Write down all your expenses including every penny you spend in every month. 2. Make a note of your net income. 3. Make sure you spend less thatn what you make. 4. Negotiate with all your creditors for an interest rebate or lumpsum pay off. 5. Start paying bit by bit into your credit cards debts so that the principal loan comes down as the interest would be less or may be the interest could be waivesd as most of the creditor are very understadnig now a days. 6. Start saving for the rainy day atleast 5 % from your income. 7. Create alternate income strategies. This would help you towards living a debt free life. last but not the least be happy, and live a balanced life style. Look inside first to change the outside. If you think by cutting your cards you miget reduce your debts, may be for some tinme. A while later you are bound to get few other cards, as our mind is like a monkey!Jumping from one to the other since we do not know how to make it quiet! How different is the prepaid credit card from bank account? What you suggest is premature to the situation but is excellent advice to stay out debt once you have cleaned the problem or at least established some sort of control. 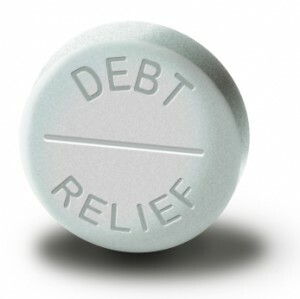 You are better off to get a debt manager from an accounting firm or a government agency who then looks at your debts;sets up a controlled repayment program that satisfies you andyour creditors;thereby allowing your creditors to feel will be taken off over time without the drastic step of personal bankruptcy. If you have all that cash to buy a credit/debt card then you really aren’t that badly in debt. Hi Raymond, I think you’re spot on in what you say here, I have been in financial planning for over 25 years and the people I have found that the people who do get into high debt is because of them increasing their limit on their cards. I’d never even considered a pre-paid credit card. I’m not even sure I knew they existed. Thanks for the tip. I always appreciate your take on things. Great advice, I just did this! This goes along with the old adage: If you can not afford it with your own money, don’t buy it until you can. Prepaid cards are great, they will stop you from ‘splurge’ purchases, because if you get that purchase – you will have less money for the things that you really need. Large purchases: Sleep on it. Take 24 hours to decide if you really need that item, or if you just want it. Every Purchase: Is it a purchase of want or need. If you don’t really need it, why do you want it? Will it help you succeed in what it is you want to do with your life? If not, reconsider. Raymond, I guess your advice is that they either preload the card with the wages they get or whatever cash their parents gave them. Is that right ? Yes OK this makes sense. You certainly can’t do much without some form of plastic these days. A debit card would do the same thing BUT with no overdraft facility. What’s next? That’s what keeps me awake at night.